Extreame Savings Item! 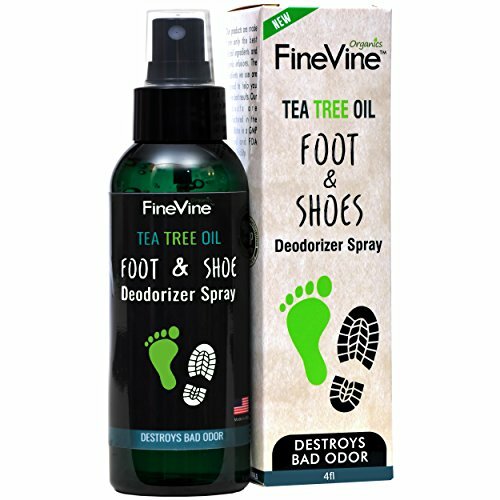 Save 50% on the All Natural Shoe Deodorizer and Foot Deodorant Spray - Made in USA - with Peppermint, Tea Tree, Eucalyptus and Essential Oils to Remove Bad Odor and Scent - Best for Stinky Shoes, Smelly Feet & Sport by FineVine at Ms Deane. MPN: FV006. Hurry! Limited time offer. Offer valid only while supplies last. Minimize Sweaty Feet & Unpleasant Odors With Just A Spray! If you are struggling with... ... sweaty feet. ... smelly shoes. ... feet bacteria. Minimize Sweaty Feet & Unpleasant Odors With Just A Spray! Then FineVine Organics all natural shoe deodorizer is the way to go. Win The Stinky Feet Battle With FineVine Organics Antibacterial Odor Eliminator Deodorants! Did you know that each foot has more than 250,000 sweat glands that produce more than a pint of sweat every day? Shocking right? Excessive perspiration along with lingering bacteria can cause offensive foot odor. No more embarrassing moments for you ladies and gents! Eliminate the shame of having to take your shoes off in public when you have sweaty feet! Entering FineVine Organics odor eliminator deodorizer. Its all natural formula, portable design and highly effective antibacterial agents, make this foot deodorizer an absolute must have for all. 1 Foot Odor Eliminator Spray So Many Uses! FineVine Organics foot spray is a multifunctional moisturizer. It contains a fine blend of various and antimicrobial essential oils that eliminate bacteria that causes foot odors. Relieve itchiness, hydrate and calm your skin and moisturize your feet as well. Neutralize bacteria, refresh your tired feet and enjoy odor less feet from now on. Spray on a daily basis or when needed. Keep an extra one in your car, travel bag and at the office. Use it a freshener in sports bags or locker rooms. Suitable for all kinds of shoes! From sports shoes, flats, ballerinas, work shoes and boots to fancy shoes, trainers, heels, pumps and even your slippers. What are you waiting for? Say goodbye to smelly and sweaty feet once and for all. With a FineVine Organics antiseptic foot spray. STOP UNPLEASANT FOOT ODORS: Looking for effective ways to combat smelly feet and inhibit bacteria growth? If so, then a FineVine Organics all natural foot deodorant is the way to go. Forget about smelly feet. Forget about sweaty toes. Forget about stinky shoes! Enjoy long lasting foot freshness with this odor remover spray. CRUEL WITH BACTERIA - SMOOTH WITH FEET: Thanks to its all natural formula this foot deodorizer is 100% safe for all. Men, women and teens. Remove bad odors from your shoes effortlessly and moisturize your feet at the same time. Deodorizes and keeps your feet fresh all day long without ever clogging your pores. EASY TO APPLY ON ANY TYPE OF SHOE: Eradicate nasty foot smell and lingering bacteria easily f rom this day on. Use a FineVine Organics shoe deodorant. Our foot odor eliminator spray comes in an ergonomic bottle sprayer for facilitated use. Spray inside your shoe s , wait a few secs to dry and let it do the rest. FORTIDIED WITH ONLY THE FINEST OILS: Using a powerful combination of Peppermint, Thyme, Te a Tree, Eucalyptus and other essential oils, this odor eliminator spray is a keeper. It contains no parabens, no harsh toxins, no additives, no chemical substances. Fight foot bacteria and shoe fungi in a whole natural way. PROUDLY MADE IN THE USA: All o f our products are proudly made in the USA under strict safety regulation s and test ing . Treat your feet with only the best. Perfect for running and leather shoes, boots, sneakers, ballerinas and high heels. Ideal for traveling, walking, workouts, bas ketball, golf, gym, soccer practice and others. If you have any questions about this product by FineVine, contact us by completing and submitting the form below. If you are looking for a specif part number, please include it with your message.